Output Resolution: 480, 480p, 576i, 576p, 720p_50Hz, 720p_60Hz, 1080i_50Hz, 080i_60Hz, 1080p_50Hz, 1080p_60Hz. 16bits Color on screen display(OSD). Storing memory: 100 satellite, 4000 Transponder and 6100 channels. Supported Multi-language menu(English, German, Russian, Arabic, Hungarian). 7 days Electronic program Guide(EPG). Software(data, kernel and file system) upgrade through USB. S/PDIF Interface for digital bit stream out(AC-3). Supported weather forecast, stock view, currency converter, YouTube, Rss, prayer time, grooveshark player. 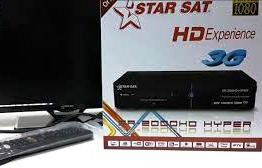 As we all know STARSAT SR-2000HD HYPER set-top-box is very popular for free CCcam server and for IPTV service. Here you can get latest firmware software of STARSAT SR-2000HD HYPER. Download latest company firmware software of STARSAT SR-2000HD HYPER.